Price inflation for food and drink rose sharply between July 2016 and July 2017, going from minus 2.6% to +2.6%. But could those increases have been even steeper? In this post we examine the evolution of the UK supermarkets sector. Monitoring their pricing behaviour can be important for understanding short-run inflationary developments given the supermarkets’ high share of imported goods, the general volatility of food prices, and the fact that the largest four supermarkets account for over a quarter of UK retail sales. We find that intense competition in the sector has slowed pass-through of higher import prices following sterling’s recent depreciation. 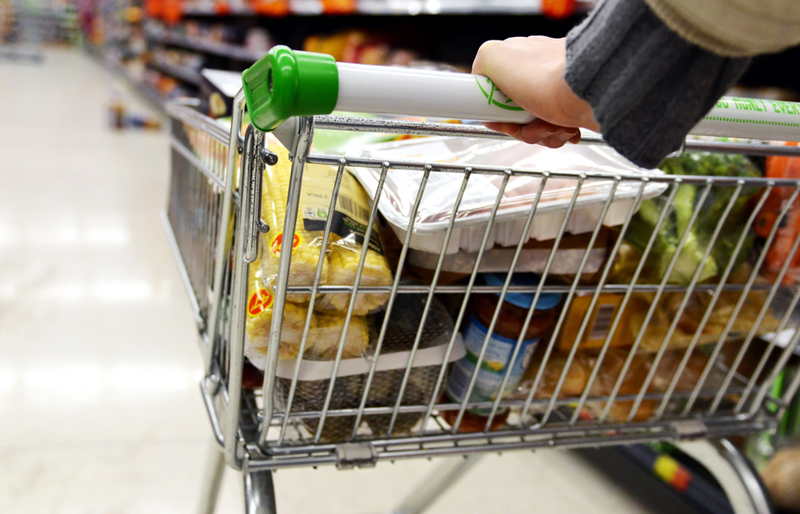 We think that competitive pressures will bear down on food price inflation for the foreseeable future, despite pressure on supermarkets’ margins. There are two distinct periods in the recent history of the supermarkets. The first —broadly the decade to 2012 — was one of rapid domestic expansion. The big four supermarkets — Tesco, Sainsbury, Asda and WM Morrison — grew their share of the groceries market from around two-thirds in 2000 to three-quarters in 2007-2012. In addition to expanding their catchment areas, supermarkets grew through broadening their product ranges — mostly in non-food goods retailing (for example, in clothing and electrical goods) but also some consumer services such as restaurants. That in turn necessitated larger stores, often located at out-of-town retail parks. Finally, the supermarkets improved non-price competitiveness through the adoption of multi-channel retailing, especially e-commerce, through ‘click and collect’, home delivery and online banking. This period was associated with very substantial investment in new stores, regional distribution centres and IT systems covering logistics and e-commerce. There was also a large increase in staffing, commensurate with the rapid rate of new-store openings. Including acquisitions, total store numbers of Tesco, Sainsbury and WM Morrison increased by nearly 60%, while total employment (measured in full-time equivalents) grew by almost one-sixth, from 2004-2012. These trends were partly in response to the supermarkets’ perceptions of changes in consumer behaviour. Those included increasingly affluent shoppers’ preferences for a greater choice of goods within a single store and improved convenience — including shorter travel distances to the store, larger car parking facilities and home delivery of goods ordered online. Competition between the major grocers for new sites was intense, and the urban density of supermarkets increased significantly. The associated increase in capacity measured by total retail floor space exceeded the growth of the big four supermarkets’ sales volumes. So there was a steady decline in sales intensity, i.e. sales volumes per square foot of retail space, from 2006-2012 (Chart 1). Labour productivity slowed (Chart 2). Note: Years shown relate to the financial years of the various retailers. Sources: Annual Reports of the various retailers, ONS and Bank of England estimates. Recent developments have seen the abatement, or reversal, of most of these trends. 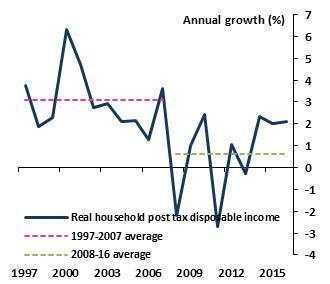 Households have suffered a marked slowdown in the growth of their disposable incomes since the financial crisis (Chart 3). So it’s not surprising that consumers began looking for cheaper alternatives at a time when technological improvements meant they could compare prices much more easily, at home and on the move using smartphones. order online. In 2016 Q4, 25% of non-food retail sales were made online. By contrast, the share of grocery sales made online has increased more slowly and was just over 5% in 2016 Q4 (Chart 4). 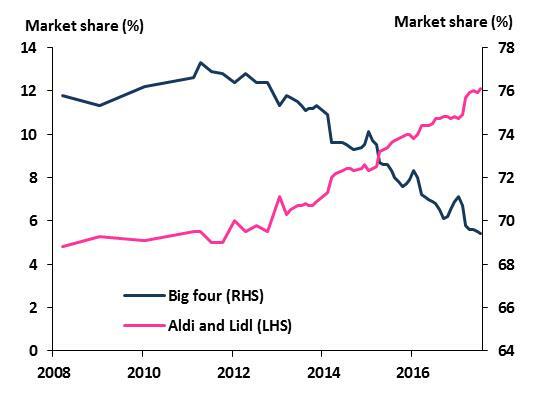 These changes have led some consumers to switch away from the large supermarkets offering wider product ranges towards lower-price, “no frills” competitors: in particular, to Aldi and Lidl (Chart 5). Their estates of out-of-town hypermarkets have suffered a loss of non-price competitiveness to more conveniently located urban, metro-type grocery retailers. More consumers now purchase their staple groceries at discount retailers such as Aldi and Lidl, while completing their weekly shopping at one of the major supermarkets. According to Kantar Worldpanel, the groceries market share of the big four has declined from a peak of just over 77% in 2011 to 69% currently. 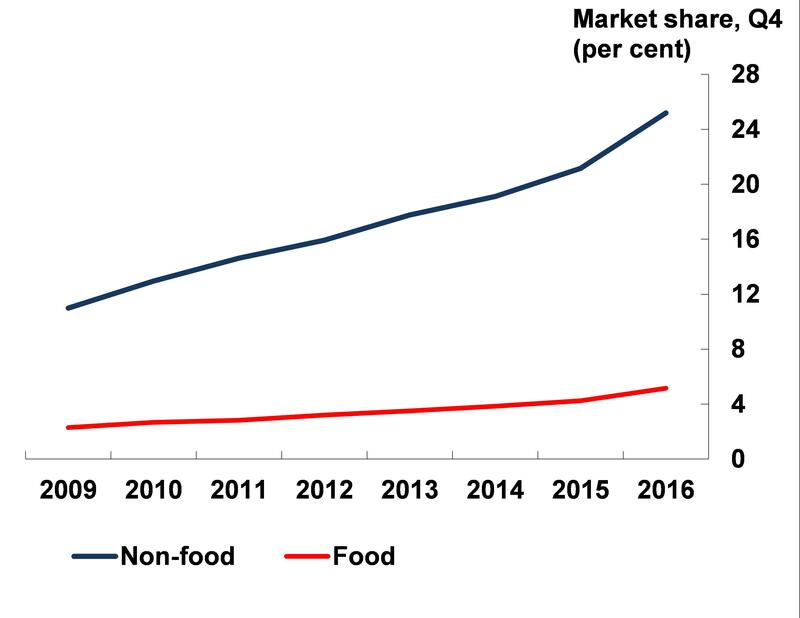 By contrast, the groceries market share of Aldi and Lidl more than doubled over the same period to 12%. Figures published by The Grocer magazine suggest that Aldi and Lidl are consistently cheaper than the big four supermarkets on the narrower range of items they stock. Pure internet retailers have benefited from substantially lower overheads, predominantly arising from much smaller estates of commercial property. That has contributed to some of the supermarkets losing market share in non-food. Online food retailers have struggled to have the same impact. That reflects a number of downsides: the fees charged for the service, the risk of unwanted substitutes and the trend to smaller numbers of purchases per shop (see above). Can Goliath fend off David? How are the majors responding? 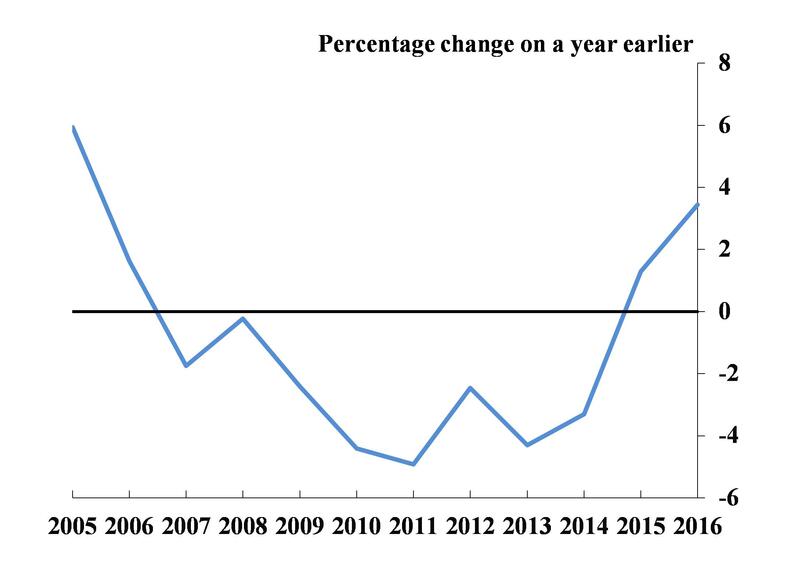 The effects of persistent changes in consumer behaviour; the emergence of new bricks and mortar and e-commerce competitors; and greater price transparency on account of the internet, have led the major supermarkets to abandon further growth of floor space, and instead focus on improving price competitiveness and productivity (Charts 1 and 2). The majors have gone ‘back to basics’ and closed unprofitable stores; reduced staffing in ‘back office’ functions while adding shop-floor staff; simplified product ranges (including greater focus on value-for-money and own-label products); and accelerated the adoption of simpler pricing by moving from irregular promotions and multi-buy offers to everyday low prices. They continue to look for ways to automate, innovate, cut costs and use existing space more effectively. Looking to the future, evidence from other European nations such as Ireland suggests the discounters could increase their UK market share to perhaps 15-20%. Indeed, their announced plans are consistent with continued expansion. This leads us to believe that the price wars — which have been a marked feature of the UK grocery sector in recent years — will continue. Of course, these price wars are taking place in an increasingly challenging cost environment for retailers. Alongside issues such as rising average labour costs (for example, due to increases in the National Living Wage), there has been a sharp rise in import costs. Sterling has fallen almost 20% since its peak in November 2015, while food import prices have risen by 8%. About 40% of UK food and non-alcoholic beverages (FNAB) is imported, and dollar prices of many UK produced commodities such as wheat are set globally. 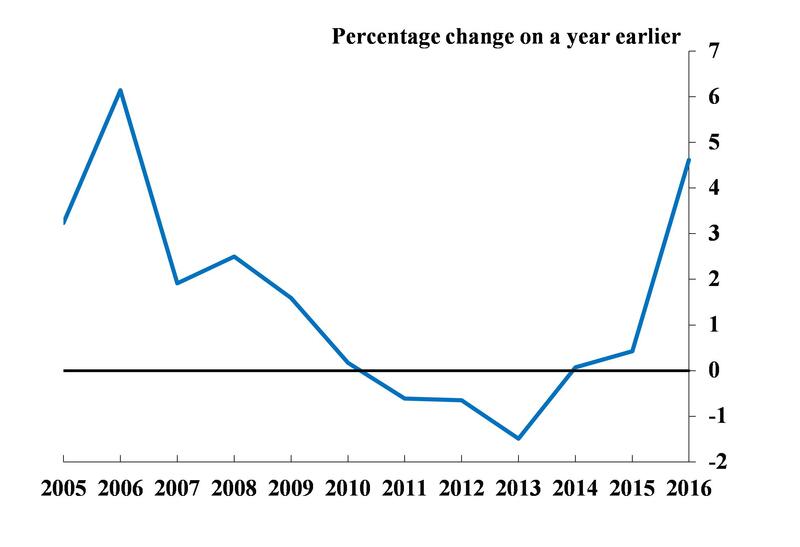 In past episodes when sterling has declined sharply, pass-through of higher import prices to retail food and drink prices has been relatively fast. But FNAB prices in UK shops actually fell throughout much of 2016 (see Chart A, p26, February 2017 Inflation Report). And, despite rising by 3% since late-2016, they are currently no higher than they were two years ago. Contacts of the Bank’s Agents in the retail sector and their supply chains report this restraint is at least partly due to the intensely competitive environment of food retailing described above. Acutely aware of the price sensitivity of consumers – and the increased choice available to them – retailers have been forced to sacrifice margin and seek cost reductions in their own businesses and from suppliers in order to keep prices as low as possible. Competition for market share between the major supermarkets has left the sector with excess capacity, while the recent expansion of the discounters has opened up significant price differentials. These two factors are likely to bear down on retailers’ margins and FNAB price inflation for some time. Tim Pike and Juliette Healey are Agents who work in the Bank’s Monetary Analysis Division. Carleton Webb is an Economist in the Bank’s Monetary Analysis Division. Previous Post Who withdraws money from distressed banks? Next Post Beyond blockchain: what are the technology requirements for a Central Bank Digital Currency? In the US, we are seeing Food Price Deflation not Inflation, Supermarkets vs Trader Joes/Aldi’s/Lidl’s, Wal Mart/ now Amazon via their take over of Whole Foods and cutting prices by 50% on many Whole Food products. Wal Mart has been forced by Aldi’s to reduce prices, example box of Wal Mart Cereal reduced by 30%, many more such examples. Meanwhile Amazon/Whole Foods form stiff competition to Major Supermarkets and Wal Mart and specialty on line food shopping such as Blue Apron. We have seen Major Supermarket Chains close stores due to the competition and lower prices. This all goes along with what the Globe has entered, Deflation taking strong hold on Global economies, many commodities are seeing dead cat bounces before they turn down to test their lows. Are there any available statistics of the relative pricing of online only retailers vs bricks and mortar? One would assume even with price pressure from Aldi and Lidl that lower overheads would lead to internet only ops being able to undercut them both – of course has not yet been born out in market share statistics possibly due to lack of consumer awareness, and price parity on many products for the (I believe to be) largest online only retailer: Ocado, because of their tie in with Waitrose.